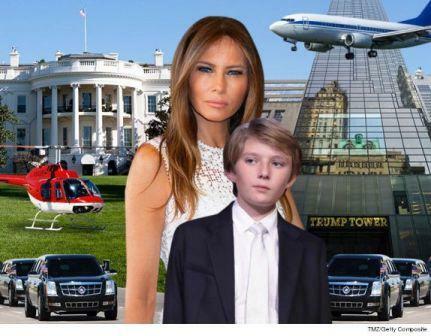 In her interview with Parenting, Melania also dropped the bombshell news that Barron’s digs at Trump Tower are so sweet, he actually has an entire floor to himself, complete with his own personal flourishes that include the incorporation of “planes and helicopters” into the decor of the rest of the house. Not only that, but it was no big deal if he wanted to draw all over the walls, because “we can paint it over,” she said. With that kind of set-up, it’s no wonder that they weren’t in a rush to move him into the White House. And though he’s not getting his own wing of the executive residence, his lifestyle isn’t exactly getting downgraded. According to Inquisitr, the White House has a staff of 100 people who “will know what every member of the Trump family likes, as far as food, snacks, and personal items. This will be stocked and waiting for the family so they can obtain it at a moment’s notice.” Rumors even swirled that Barron’s getting a Goldendoodle puppy, named Patton, to go along with his new home, so at least if he gets homesick, he’ll have a new buddy around to cheer him up.